Escalus Luxury Suites overlooks Via Mazzini, the most beautiful and renowned shopping street in Verona. It is located only 30 meters from the Arena of Verona, the Roman amphitheater, which hosts a prestigious lyric opera season during the summer. It can be conveniently reached by our Guests, already in their formal attire. In a historical building with the elegant shop windows of Furla, Escalus Luxury Suites offers a stay in the heart of Verona’s shopping district between Via Mazzini, Piazza Bra and Piazza delle Erbe. Rich in art and culture, the historical centre of Verona includes, among many other gorgeous sites, the medieval Scaligero Bridge and Castelvecchio, the ancient residence of the Lords of Verona. Nowadays it has been transformed into an impressive Civic Museum, skillfully restored and organized by Carlo Scarpa, which boasts the famous equestrian statue of Prince Cangrande della Scala. In just a short walk from the hotel, you can find the famous Juliet’s Balcony and admire the statue of the romantic heroine. Strolling through Verona, the buildings from the Renaissance, Porta dei Borsari, Piazza Sant’Anastasia and the outdoor market in Piazza delle Erbe will lead you into an enchanting experience for any traveller who falls under the spell of the fascination and vivacity of the town centre and the performances staged in the impressive Roman Theater. Verona is also an important business-manufacturing centre and its suburbs are home to many corporate headquarters and businesses (food growers and processors, shoe factories and wineries). Furthermore, every year Veronafiere attracts almost 1 million visitors to the exhibit spaces of, among others, Vinitaly, Fieracavalli, Marmomacc. 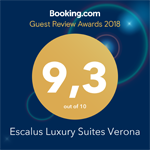 Arrive at Verona Porta Nuova train station and take a taxi or city bus (n. 11, 12, 13, 51, 52) in front of the station towards Piazza Bra and the Arena; Escalus Luxury Suites is only 30 meters from the Arena of Verona. Take the A4 tollway and exit at Verona Sud, follow the signs towards “centro storico” and the Arena. When you reach Piazza Bra, turn right into Via degli Alpini and go ahead for 300 meters, then turn left into Stradone Maffei, which flows into Stradone San Fermo, and take the second left, Via Malenza. Continue straight along Via San Cosimo and turn left into Via Anfiteatro. When you arrive behind the Arena, turn right and, shortly after, right again, into Vicolo Tre Marchetti. Vicolo Tre Marchetti is located in a limited traffic area (ZTL). When you make your reservation, please give your car plate number so that you can freely enter this area and you will be given information about parking near the hotel. Verona’s Valerio Catullo Airport is 12 km from the old town centre. Reach Piazza Bra and the Arena with the Aerobus that goes to the train station, then follow the directions under “By train” – or, in alternative, take a taxi.